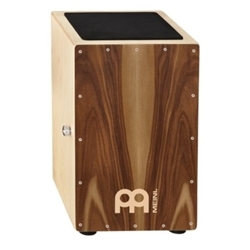 Make the brilliant design and refined tone of Meinl Percussion's CAJ1SNT-M Modern Snare Cajon the heartbeat of your music. The CAJ1SNT-M balances the ruggedness of all-rubberwood construction with the beauty of an American white ash soundboard to impart natural presence, added response and sensitivity, and warmth to your tone. The snare strings are easily adjusted using the knob on the side - you can dial in tone that gives your rhythm the voice it needs to cut through the mix when you're onstage and the strength it needs to keep the beat during acoustic jam sessions. At Remix we know you'll appreciate the careful thought and design Meinl put into every aspect of your CAJ1SNT-M Modern Snare Cajon. The Meinl CAJ1SNT-M puts comfort and tone at the center of your percussion kit!